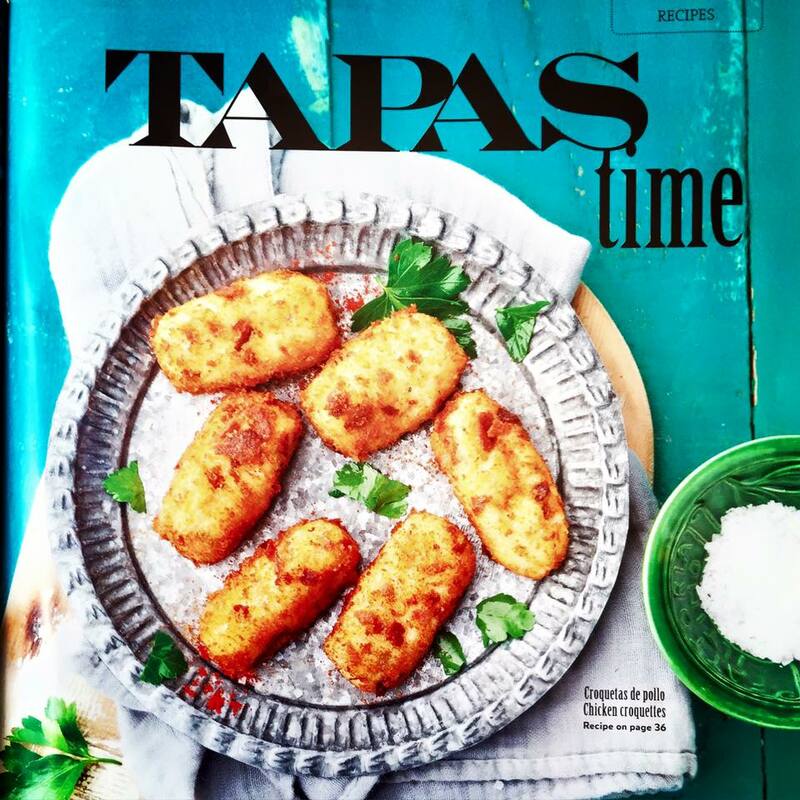 We were delighted to be asked to collaborate with Food & Wine Magazine on a feature of Lola's tapas in the run up to what we hope will be a fabulous summer. It turned into a beautiful, colourful 9 page spread. Please excuse the roughness of the photos as simply shots of the magazine.. but below we've given you the receipes to try at home. In a frying pan on a low heat, place the sliced apples and sugar and cook until the sugar melts. Add the wine and cook until the consistency is like puree (20-30 minutes). In a frying pan on low heat, add the oil, onion and salt and cook until golden brown. Add 150ml water from the piquillo jar; cook for 5 minutes. Then pass through your blender and set aside. Put the water, potatoes and salt in a large pot and bring to the boil for 20-40min dependent on the size of the potato. When cooked, drain and cool. In a pan on low heat, add the olive oil, onion and salt and cook until golden brown. Then add the black pudding, oregano and paprika and cook for 10 minutes. Peel the potatoes and mash them adding the black pudding to the mash. With the mixture, make bite size balls - pass through the flour, eggs and then the breadcrumbs. Put in a plate with kitchen paper to extract excess oil. For each bombita, place a teaspoon of apple compote then the bombita on top and a dot of piquillo on top again and continue. Place a large pot on a medium heat; add the oil and all the veg. Cook until soft. Then add the whole chorizo, black pudding and bay leaf. When the chorizo starts taking color, add the salt and paprika. Cook for 45 minutes on a low heat. After that time, check if the lentils are cooked, if not allow another 20 minutes. Tip: To serve, cut the morcilla (black pudding) and chorizo into chunks. Add a ham bone for extra flavour during the cooking process. Place a frying pan on a medium heat; add the oil; when oil heated..
Add the prawns. When they start to sizzle, turn the prawns over and add the garlic, salt and chillies. When the garlic is golden brown, take the pan off the heat and add the paprika and toss. Toss the prawns in the brandy (off the heat). Before serving, have a final toss over the heat and serve. Tip: Have some delicious bread at the ready to soak the oil! Soak the chickpeas for 12 hours before using. Bring the water to the boil; add the spinach, cook for 10 minutes; drain and keep to the side. Take a frying pan on medium heat and add the oil and sliced garlic. When golden brown, add the chickpeas and cook for 5 minutes. Add the cumin, salt and paprika. Stir constantly, then add the spinach and cook for a further 5 minutes. 1.5 tablespoons extra virgin olive oil. Bring the 5 litres of water to the boil; add the octopus. It’s very important to “scare” the octopus – this means dunking the octopus (leave in for 5 seconds); take it out and do it again (3 times). This is to ensure delicious tender octopus. After the third time leave the octopus in the pot; add the bay leaves; 3 teaspoons of salt and then lower the heat to simmer. Cook for 45 min. After 45 minutes; spear the octopus with a skewer or knife; if it goes in smoothly, the octopus is tender and ready. Meanwhile put the water, potatoes and salt in a large pot and bring to the boil for 20-40min dependent on the size of the potato. When cooked, drain and cool. When the octopus and potatoes are cooked; cut the (peeled) potatoes and octopus into slices. On a wooden platter, make a layer of potatoes, and then cover with a layer of sliced octopus. Dust with paprika, sea salt and the extra virgin olive oil and serve. This should make two platters for serving. Tip: Use the tentacles for this dish and the rest for a fab paella. Pre heat the oven to 200C for 15min. Wash all the veg and put on a baking tray with the teaspoon of salt and pour the olive oil on top. Roast at 170C for 1 hour, turning every now and then to cook evenly. Check the veg is soft. If not, leave it for another 20 minutes. The time may vary depending on the size of the veg and the oven. When the veg is ready, keep the juice from the tray. Allow to cool. Then peel the peppers and remove the seeds. Do the same with the aubergines. Remove the first layer of the onion. Chop all the veg in strips and place in a bowl. Add the juice, salt, extra virgin olive and vinegar. Serve cold from the fridge with toasted bread. Tip: Add salted cured anchovies at serving stage for a fishy twist. Put a glass of milk in a bowl with the corn starch until it is completely dissolved. Add the yolks and the sugar - mix well and set aside. In a pot, place the rest of the milk, cinnamon and the lemon peel. Bring to the boil. Once boiling, set aside off the heat and allow to rest a few minutes. Remove the cinnamon and lemon peel and then add the mixture from the original yolks and sugar mix, stirring constantly. Place the pot on a low heat again. Stir until the mix starts to thicken. After 3 or 4 minutes, pour the crema into small clay cazuelas or ramekins. To serve sprinkle a thin layer of the sugar on top and caramelize the sugar with a blow torch. Tip: When peeling the lemon never use the white part as too bitter. Combine the chocolate and milk in a saucepan on a medium heat. Cook and stir for 5 minutes until the chocolate melts and the mixture is smooth. Place the water and the salt in a pot and bring to boil. Once the water has boiled add it to the flour with a wooden or plastic spoon and mix until smooth. Place in a piping bag with a 2cm diameter head and make 10-12cm long churros. Add enough oil to a large saucepan to reach a depth of 6cm. Bring to a medium heat. Deep-fry the churros for 1-2 minutes (or until golden brown). Use a slotted spoon to remove churros to kitchen towel to extract any excess oil. Pour chocolate sauce into a cup or ramekin. Dust the churros with granulated sugar and dip! Tip: It’s easier to pipe the dough while it’s still hot.